FPW Racing have enjoyed a strong weekend at Silverstone Race Circuit with Storm Stacey taking another couple of 2nd place finishes to help secure his second place position overall in the championship!! The weather at Silverstone was changeable all weekend but luck was on our side and all but one of the sessions were run in dry conditions.Storm top the time sheets in Friday’s FP1 & FP2 Making a positive start to the weekend. Saturdays Qualifying was the Team’s first wet session this year on the new KTM. They worked hard to find a good wet setting which resulted in Storm qualifying in fourth position 0.47 seconds off pole. Race 1 proved even more excitement as Storm had an excellent start from 4th position off the grid going into the first corner 3 abreast with Jake Archer and Jack Scott – continuing the battle throughout the race with continuous position swaps. Storm finished the 18 Lap Race on the Silverstone National Circuit in 2nd side by side with Jake being half a wheel ahead – the time sheets showing Storm only 0.033 seconds behind, putting in the fastest lap positioning him on pole for Sunday’s Race 2..
After rider de brief and Not having to make many set-up refinements overnight, Storm was ready for the 22 lap race on Sunday. biting, Heart stopping Race, unfortunately towards the end of the race they caught up with a huge amount of back markers, Archer again managing to gain advantage of this taking the win against Stacey and Scott who were in close pursuit. Storm is currently 2nd in the Championship with 246 points – 60 behind the Leader Jake Archer and 29 points in front of 3rd place Jack Scott. 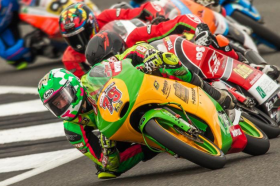 Round 10 of the HEL Performance British Motostar Championship At Oulton Park Circuit 14 – 16th September 2018.